Birthdays are very special, so we want to help you plan the perfect party for your child! We have a covered, mosaic patio in the back for parents to relax and catch up with friends. Drop off is also welcome! PRICE: $375 for the first 7-10 children, $15 per child after that. This include the arts + crafts lesson with a take home craft, set up of the craft project, clean up of the party and a HAPPY BIRTHDAY chalk wall design! Minimum: ALL AGES 7 kids. HOURS: Parties are an hour and a half long, If you want to add more time it is $75 per 30 minutes. You choose your time upon availability. You have 30 minutes before to set up and 20 minutes after for clean up. CRAFTS: We have so many fun crafts to chose from! You are welcome to chose a craft from our GALLERY or Instagram. If you have a theme we can create a craft for your theme! Please note not ALL crafts in our GALLERY and Instagram are for parties. 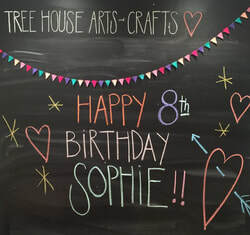 ​Please email us at treehouseartsandcrafts@gmail.com to plan your next party! We have some really cute PARTY PACKAGES! They include everything from above along with themed plates and napkins! We can also do party favors if need be! This is one of our most favorite crafts! The kids love making these houses and use them for the tooth fairy too! You can chose from the mushroom plates and napkins or the flower plates with leaf napkins... OR you can mix it up! Cat house with cat plates + napkins... meow! Either way it will be a magical day! Dog houses with dog plates + napkins.... woof woof! Is your child obsessed with making slime? Do they beg to make it and you say NO because its so messy? If so, this is the perfect party for them and for you! All the mess is here and not at your house! The kids make 2 batches of slime with container, they measure all the ingredients out and create their own SLIME! Kids 6 and under can also have slime at their party! They will only add glitter to pre-made slime. This can be added to any package for $10 per child. FLOWER PARTY PACK. . . flower craft with daisy plates + leaf napkins! Everything you need for the perfect ARTS + CRAFTS party in your home, all in ONE box! You chose the craft and we put it together! This includes everything from paint to brushes to glue, any and everything you need! We can even add plates, napkins and a birthday banner! Starting price is $300, but varies. Pick up is free and delivery is available for a small fee. If interested or for more details please email us! For friends ages 21+. . . Spend the evening sipping on cocktails, catching up with your friends, crafting and shopping! We provide all the crafts supplies, lite bites, a signature cocktail and Pattywhacks (Annie's mom's precious clothing store located in the front) offers 10% off all sales for anyone who enrolls! Get your friends together and join us for your next girls night out! BYOB/ 6:30 - 8:30PM/ $45 - $55 per person depending on the craft. For more information or to book your next girls night out, please email us at treehouseartsandcrafts@gmail.com! PRIVATE PARTIES . . .
You can choose your own date, time and craft for you and your group of friends. We also host showers, holiday parties and more! For more info please email us, we would love to be a part of your next party!